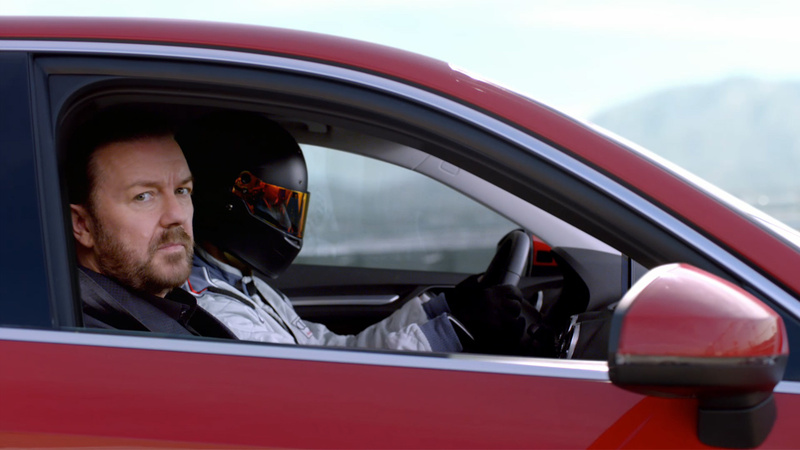 The Mill's Gareth Parr, shoot supervisor and 2D lead artist, gave us some details on the project: "one of our key challenges on 'Dues' was creating the photo-real matte painting where you see Ricky in the car at the race-track basking in the glorious Los Angeles sunshine this was actually filmed in New York, which is where Ricky is based and during a seriously cold winter. We also duplicated crowds, projected the work of artist collective Cyrcle onto the wall they hang off,added fire to the kitchen and breath to the cold environments. It was so interesting getting to work with Ricky Gervais and seeing him perform. I've been a huge fan of his for a long time now and seeing him ad-libbing his way through filming was a brilliant experience. Having directed himself, he really knows what he's doing on set."